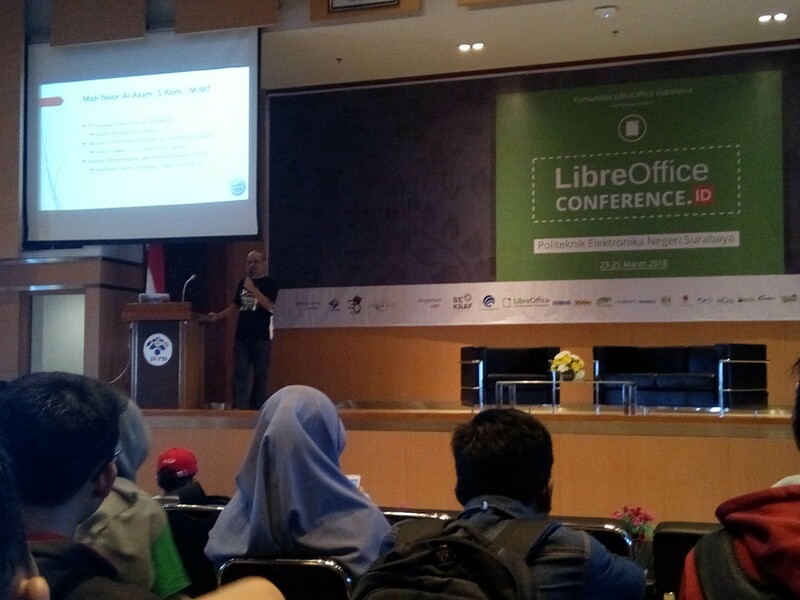 The last day of LibreOffice Conference Indonesia pack more fun, and information different than the other. 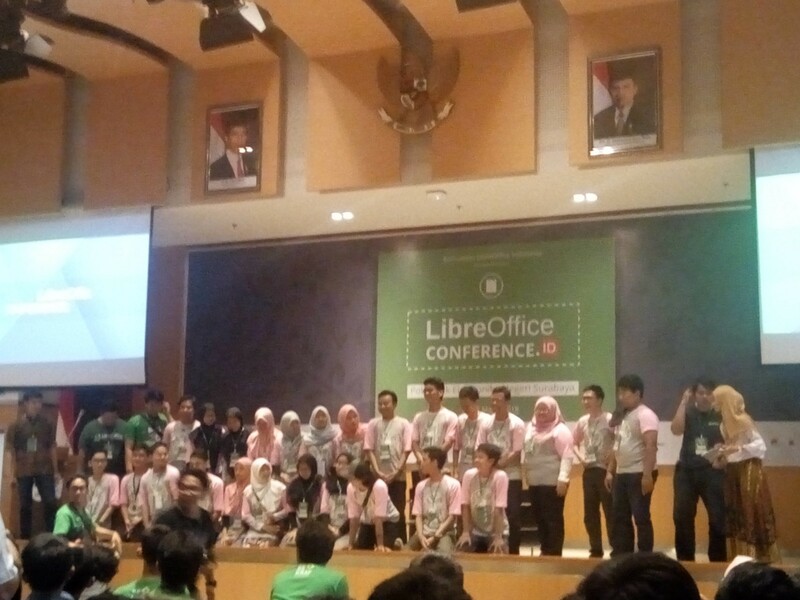 Even though this is the last day of series of event in LibreOffice conference Indonesia, every participant still look forward to participate every remaining event until the end. But for me it seems i cant focus much on writing my note, since there are so many information that i need to understand before writing it to my note and publish an article based on those note. I’ll try to recall every information i could that not written my note as i write this article. The first session is talking about “The Importance of Open Standards Data” presented by Mr. Noor Azam (Branch Manager RADNET Surabaya, and member of KLAS). He started the session with stating about Standard is known as ”jagan” (or “safety grip”) in order to keep everything acceptable in several situation. the speech continued with discussing the definition of open standard which doesn’t really have an actual definition, but we can define it using basic terms of standard, which is restricted technology that approved by formalized committee. With the word open that reflects in freedom (or any thing that might come to my or your mind). Mr Noor Azam add, that closed standard leads to monopoly of certain user. In the present age where document exchanging is a must it must be emphasized about using digital data(or information) to exchange document instead of using paper. Mr. Noor Azam also express his concern of the state of journal publishing which is locked to doc and docx format one of the closed/proprietary format. the reason is some Publication institute musts it’s writer to use proprietary format. This concerns also applies to Indonesia government, where Indonesia ministry locked in proprietary software for it’s office needs. There also global advocates for open standard and technology development called “Open Stands” which support the principle of open standards, it is supported by the inaugural signatory organizations of IEEE, ISOC, IETF, IAB, and W3C, also many signed supporters. He also describe some of practical advantage in using open standard which is it’s availability without using any paid software to open document. In my curiosity i also asked some advice in spreading he word of using open standard into higher-up person, his answer is a statement that it’s hard to influence people in using open standards with bottom up scheme (where we the bottom influencing the higher-up). He also adds some advice if we can’t influence them (inside a college environment) we should follow the rule for the time being, but afterward we should prove that open standard is a serious, and successful project. The next session is about “LibreOffice 6.0 — Positioning and Main Features” presented by Italo Vignoli Co-Founder of LibreOffice, someone who have a big role in presenting LibreOffice to the world through marketing. He started by introducing himself as an geographer and presents the information about software licenses trades with map that expand and shrink based on how many export or import of software licenses. He explains that most of the software license exports come from united states and it’s devastating to see united states also have really small share in software license import, which means united states have most control of software license that most people use. The next thing he share is about LibreOffice history which is fork of open office which is developed by sun and become open source on 2000 (you can find out more in internet it’ll be too long for me to write and might be inaccurate as well). Italo also tells his experience in competing with Apache OpenOffice which made him disappointed, he express that “We should share the knowledge with everyone”, he really wants us as community to work together and share the knowledge for the better. Italo also state that “LibreOffice” is one of most valuable open source project, which means LibreOffice matters in tech growth. After Italo speech the event continue with parallel class after a short snack break just like the previous day. The class i decided to enter is Eric Sun “An impressive secret of Impress”, the reason is i haven’t seen nor use many impress feature to create a presentation slide to “impress” the audience. With his attracting presentation slide and speech Eric successfully have audience attention ready to present his information with fun and attractive way. In this class he explains about the secret of LibreOffice Impress which able to do what Microsoft Power Point could and doing much more. Eric start by demonstrating how .ppt file template is easily searched, and returns many results, accessing the site there are options to download the presentation template using .ppt format. But there are no .odp format which is default format for LibreOffice Impress, no worries even with .ppt file we can still open the template and receive similar results with google slides. Eric continue his speech with introducing us with “free vectors” keyword when searching for an image. He adds that we can find more image in the internet than some image in an clip art that provided with the software. He continue with introduction of vector image where it have much better quality with it’s scalability without tearing the image and looks good even when you zoom the image. In this speech he also introduce Inkscape, a FOSS for vector image drawing / editing. Inkscape also able to open .ai (adobe illustrator files) with similar result in Adobe Illustrator, for .eps file you would need to export the file to .pdf in order to open it in Inkscape (renaming the extension wont work). Eric also state that “Inkscape is LibreOffice Impress Best Friend” the reason is .svg (scalable vector graphic, default Inkscape file format) have a good integration support with LibreOffice Impress(might applies with other LibreOffice suite). With the support of .svg we can copy entire vector object in Inkscape and paste it inside our slide in LibreOffice Impress, it is also possible to edit vector graphic inside LibreOffice Impress in case you would need quick, and easy edit to apply to the image. These feature really shows that LibreOffice not only able to do what Ms. Office Could but also do much more than Ms. Office. Eric finishes his speech with saying “The more secret you find you will strongly believe” this means the more information you get it’ll strengthen your believe in something you know. The event continues, with lunch break, followed by another parallel class. For this session i entered Mr. Sokibi class about “LibreOffice Usage — Write books with LibreOffice”. 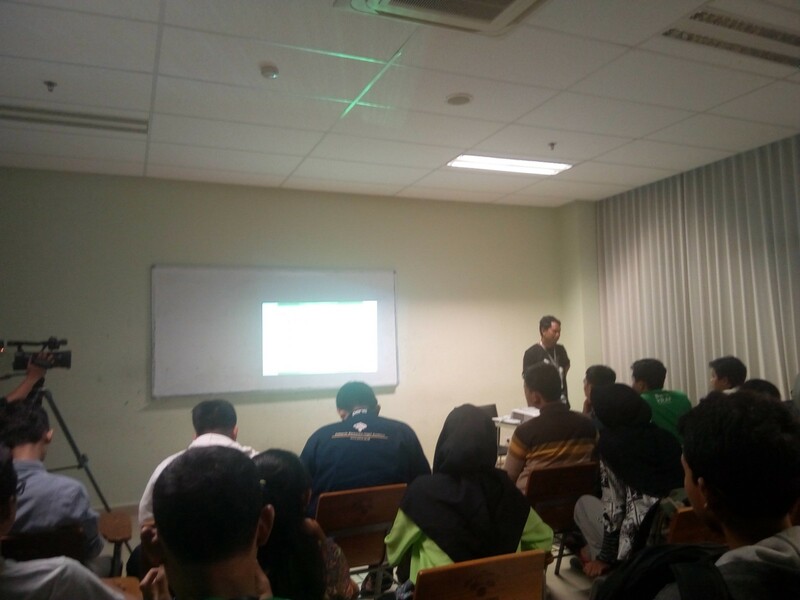 In this class Mr. Sokibi share his experience in writing LibreOffice books “Menulis Buku dengan LibreOffice”, which cover the usage of LibreOffice for writing books. it also cover about general usage of LibreOffice. He also share his trick on writing books and several other in using LibreOffice, he start by configuring LibreOffice including unit value, auto complete (dictionary), pages format, styling across several parts (pages, paragraph, etc), and pages estimation. Mr. Sokibi also emphasize for setting up your working environment in LibreOffice before writing, the reason is to increase writing speed, make writing much more organized, and avoid any unnecessary revision. In both his speech, and book also cover about using Inkscape, and GIMP to manage, and arrange any image needs. He adds that we should use many software to boost our productivity instead of using just one software. There are many more technical information about styling, and managing book content that i won’t cover in this article. You could learn more by ordering his book through link below (Native Indonesian Language). After another snack break (yeah there are many snack here and there), the event continue with Open Q&A to The Document Foundation core members. Moderated by Mr. Ahmad Haris, Italo Vignoli and Franklin Weng answer question about LibreOffice and Open Source in common. 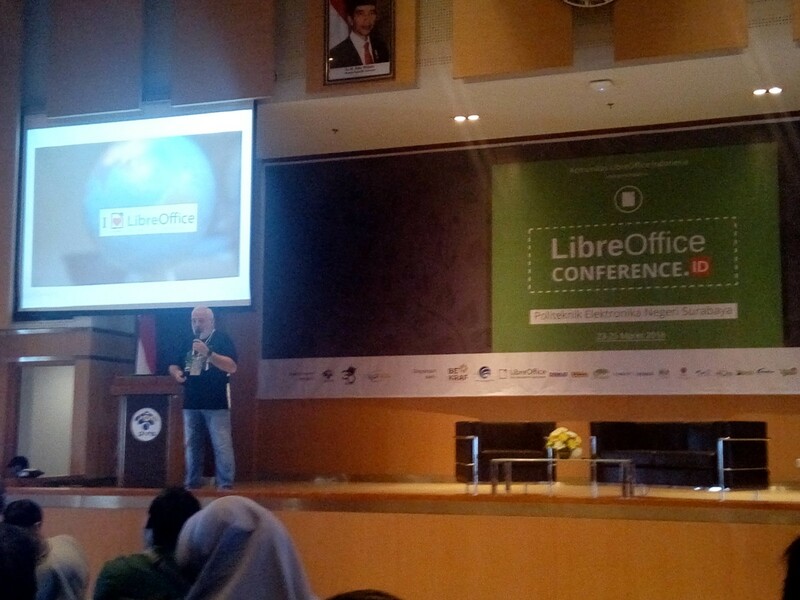 Italo mentions that it has been 38 years for him to promote LibreOffice to people all around the world. He tells to make your passion to become a job so you would have a fulfilling life. Weng tells his experience when he fails to install Windows, because of there are not much information provided about the error, in order to help him troubleshoot his problem, he ended up spending many hour because of this. He also tell us that in the old days, every software was compiled by it’s user, with probability 5% of failing if we read the readme (told ya readme is important). Italo also tells us that he travels a lot for marketing purpose, and also tell people that document foundation is also a community even though they have “Foundation” in their name. 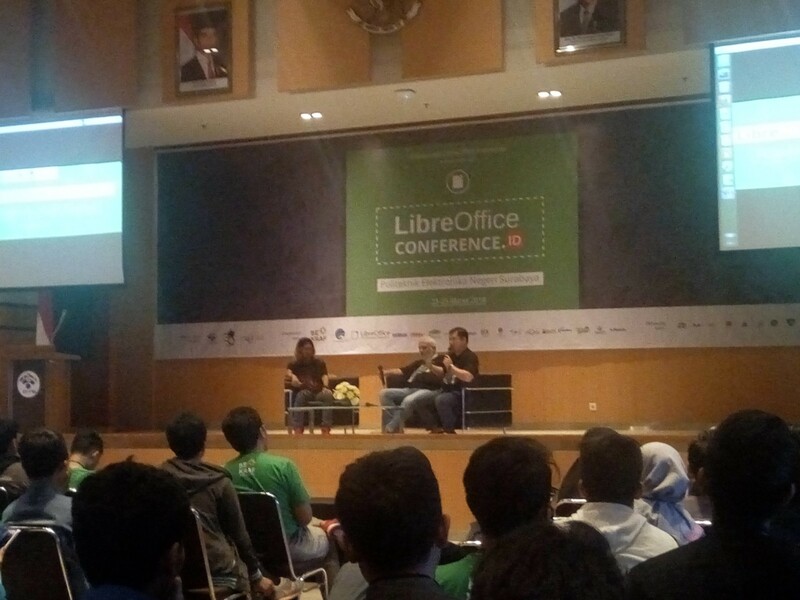 When asked about the download count of LibreOffice from Indonesia they answered that the number are getting lower, they explain it’s not because of less popularity of LibreOffice, it’s because most GNU/Linux user download LibreOffice from variety of package manager on their distribution. Like other open source software contributing to LibreOffice is not limited to code, we could contribute to LibreOffice project in many way, one could also contribute with translating to their native language or more known as localization. Italo also add even there aren’t many people using your local language, by helping localization it’ll help many user that doesn’t understand English well to use LibreOffice. Last question that pique my interest is how open source software gain money. Italo explains that it come from multiple source like, donation, and enterprise company that also want to have a major role in LibreOffice Development are willing to become ward of the board. The events are closed with award and prize distribution. At the last photo session most of the committee and participant joins the photo shoot. It is sad that this event and article series i write have to end so soon. There are many more thing that i want to tell and write regarding my time in LibreOffice Conference Indonesia, but it seems i get slower and less motivated to write and the event are getting obsolete by every day passed. I am sure that we gonna meet again in the near future, so i wouldn’t forget to add “See you next time” as a promise to meet again.